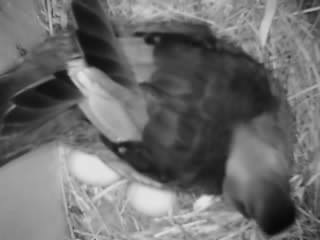 We placed a camera in the Wood Duck nest. This is the second lay in this nest this year. I wonder why the mother is not spending any time on them? Thanks for your pictures and update, Jim, I have combined the info you sent into one page. Perhaps the mother will sit on the eggs when she has finished laying several eggs. 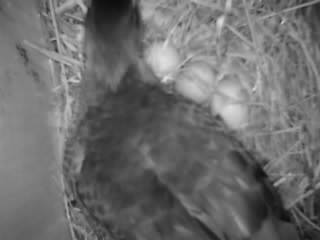 We had this happen with domestic ducks - the mother only started to incubate the eggs after she laid her last egg. On the other hand, if she is laying eggs and doesn't sit on them at all, I'm not sure what the reason could be.